Sodium Bicarbonate, Maltodextrin, FD&C Yellow No. 5, Modified Cellulose Gum, FD&C Red No. 3, FD&C Yellow No. 6, FD&C Blue No. 2, FD&C Red No. 40, FD&C Blue No. 1. Magnesium Stearate, Zinc Stearate, Silicon Dioxide, Sodium. Yikes! That's a lot of artificial colors and preservatives — things I don't feel comfortable eating myself, nor would I want to feed my kiddos. I want my 2 boys to be able to dye eggs this year... and be able to eat them when we're done. That's why I did some research to find a much more natural approach to this activity. 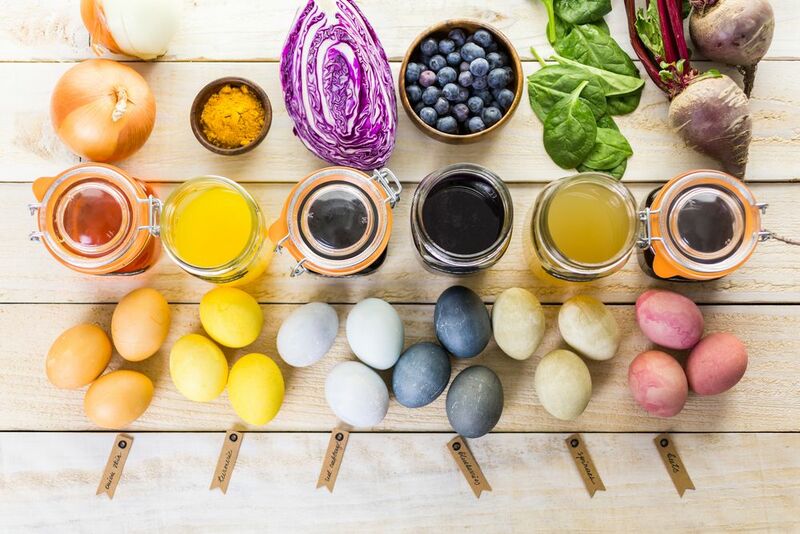 There are MANY natural foods that will work great for dyeing Easter eggs. How do you dye Easter eggs? Combine 4 cups of water and the dyeing ingredient (see list below) in a pot. Bring to a boil and let simmer for 30 minutes. Remove pot from heat, and let liquid cool to room temperature. Strain the solution into a large bowl, and stir in 1 tablespoon of distilled white vinegar for each cup of strained liquid. Arrange hard-boiled eggs in a baking dish (or other container) in a single layer. Pour dye over eggs, making sure the eggs are completely submerged. Move eggs to the refrigerator, and let steep for 30 minutes (lighter color) to 4 hours (deeper color). Remove eggs from solution, and carefully dry each one. Store finished eggs in the refrigerator. Here are some recommended ingredients for making a variety of colors. Typically, you should use about 1-2 cups of fresh produce or 2 tablespoons of a spice. Dyeing eggs can be a fun tradition to add to your Easter celebrations. I hope you'll give these natural dyes a try this year! This recipe is incredibly easy to make.. and it's seriously delicious. Great substitute for spaghetti noodles!